…it is only of late years that the ludicrous capabilities of the human mind have expanded in their fullest vigour. Comicality has heretofore been evinced only, as it were, in isolated sparks and flashes, instead of that full blaze of meridian splendour which now pervades the entire mechanism of society, and illuminates all the transactions of life. Wow. What a mighty claim to smother all the chuckles that have ever been let out in all earlier periods of history, and how delightful it must be to view the world in… such a roaring blaze of comicality? 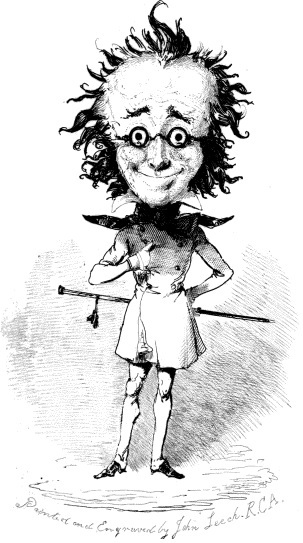 But then again, considering this noble portrait by John Leech of the author, I doubt this fellow is capable of looking at life from a serious perspective. The one and only… Percival Leigh, shown here as an ever-smiling victim of static electricity… or simply a benevolent magister. It also doesn’t surprise me that Leigh left the medical profession to favor writing. And not any writing. He was drawn towards the mighty art of comic writing. Not to mention that he wrote for Punch. So, what of this claim that the Victorians out-sillied all buffoons that preceded them? I should repeat that was made early on in the Victorian era — in 1840. I also think it was a pretty good prediction, because the Victorians, as I see them, were a very silly people. Some may stereotypically view the Victorians as stuffy or dour, but I strongly beg to differ. They amuse me to no end. I don’t think I could devote so much time to the 19th century as opposed to any other if it were to be devoid of silliness. That would be no fun at all. For an example of their silliness, consider Obaysch the hippo. 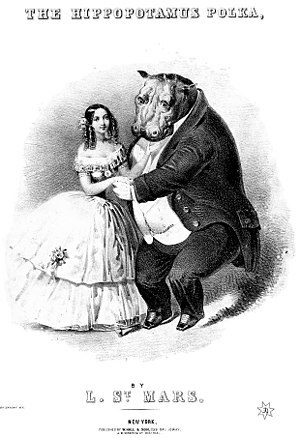 He arrived in the London Zoo in 1850, produced a total mania, a plethora of senseless merchandise, immense crowds that would send me into a state of total panic, and, most importantly, he inspired a dance: The Hippopotamus Polka. A very dapper hippo, indeed. Such are the fruits of a comical society. Velocipedomania was another comical occurrence, concerning various breeds of multi- or uni- wheeled, pedal-powered vehicles, which people today blandly refer to as bicycles. Ah, the rich variety of velocipedes never ceases to amuse me! 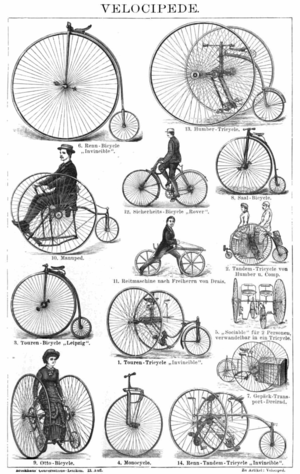 Ever perused through The Velocipede: Its Past, Its Present, & Its Future by Joseph Firth Bottomley? You ought to. I’m sure you’d agree with me. Percival Leigh calls hot air balloons and railroads funny, but I say velocipedes are funnier by far… and I am particularly fond of the monocycle, the variety in which the person rides inside the wheel. Somewhat like a gerbil. 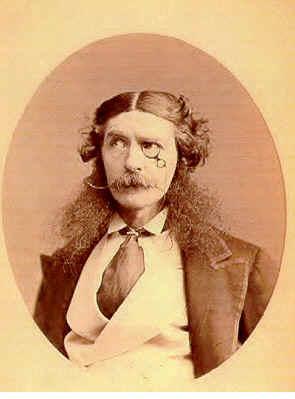 Edward Askew Sothern as Lord Dundreary… I dare you to deny the silliness of such a face. Percival Leigh states, “The truth is, that people are tired of crying, and find it much more agreeable to laugh. The sublime is out of fashion; the ridiculous is in vogue.” Of course, we all know the Victorian era was not an age dominated by laughter and devoid of tears. It was a difficult time. But — they did know how to lighten up and be silly now and then. Besides, an era full of nothing but comedy would be mind-numbing to me, as much as Leigh would have enjoyed it. I need a healthy helping of both the sublime and the ridiculous in order to remain sane. NOTE: As for The Comic Latin Grammar itself, introduction aside, I do not recommend it if you want to learn Latin. You won’t. You might be amused by some of it if you already have some Latin under your belt, but I wouldn’t call it useful, and some of it is even offensive. If your goal is to learn a language, I can guarantee confusion if this is the resource you consult. My apologies to Mr. Leigh. 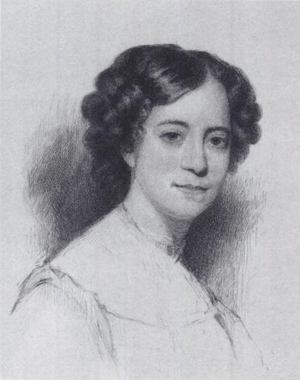 That’s what Nathaniel Hawthorne’s future wife, Sophia Peabody, said of leeches when she was a teenager. I don’t think I’d ever be able to speak of a leech with such exuberance, but… I’m happy for Sophia that they gave her such delightful relief, or that she at least thought they did. Sophia was an invalid of sorts, starting in her youth. Headaches plagued her. Loud noises set her head throbbing, and she was the sort to languish about with the typical 19th-century melodrama of her suffering. She tried numerous treatments — leeches among them. Pursuing art brought relief as well, and I personally believe it was this distraction from her malady that did her more good than any bucket of leeches. I recently laid eyes upon my first live medicinal leeches at a local science museum. Knowing their significance in medical history, I was excited to see those two serpentine, blobby beasts clinging to the side of their little watery aquarium. Certain Youtube videos of the Mütter Museum’s director and his pet leeches came to mind (I admit they make me cringe to watch and make me feel somewhat faint, but I do think it’s cute that their names are Harvey and Hunter). And as I watched those real-life leeches, I was so thankful that I’m not living in the heyday of blood-letting via leeches (not that I’d want to endure any sort of blood-letting for that matter). Of course, you cannot forget mechanical leeches, either! Leeches: Interesting enough to look at from a safe distance. But I’d rather not have them clinging to me. And no, I would not like to have one for a pet. As for Sophia… she ought to curb her enthusiasm, or all the leeches will be after her. I’m saddened by Liszt’s low opinion of his later works, particularly Csárdás Macabre. I understand they weren’t received well at the time and many of them he kept to himself — they were too futuristic, too different from what the world was accustomed to hearing (not to mention that it got to the point that he begged his students not to play his works in public for fear that they would become the brunt of great ridicule). A bit cacophonous at times, I suppose, but I like that now and then. They had great depth, plunging into realms that music had never touched before. May one write or listen to such a thing? How disheartening — it amazes me that he even went through the effort of composing these works if he had such negative thoughts about them. It almost sounds as if he was ashamed to have written such music. True, it was a dark time of his life, and this must have served as a release for him. But he did “write such a thing,” however, and as he foresaw, more unusual works were to be composed by others in the future. 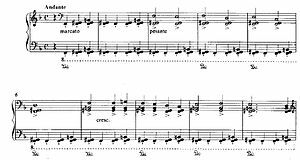 What surprises me about his reaction to Csárdás Macabre is that it isn’t one of those later works that wander into atonality, like Nuages gris or Bagatelle sans tonalité, and it isn’t as desolate as his La Lugubre Gondola pieces (I’ve heard some call Macabre atonal; I disagree). The csárdás almost reminds me of some of his earlier works, like some of the Hungarian Rhapsodies, or even Totentanz, which definitely shows glimpses of what his music would become in the future, especially in the opening bars. But he wasn’t that harsh to Totentanz, scrawling such pessimistic things on the manuscript! And I even feel that parts of his Sonata in B Minor seem futuristic — another piece that was received with some consternation at first, but again, he was not harsh about that piece. I suppose Liszt would think me a deranged person, considering that, yes — I actually listen to such things with great pleasure. One of the first pieces I ever heard by him was none other than Csárdás Macabre. 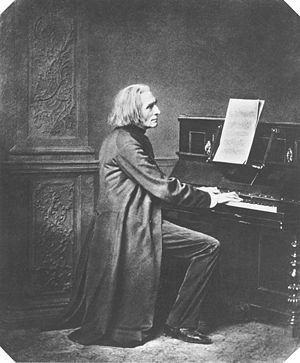 I thought it a very intriguing and dichotomous piece of music with its interesting mixture of levity and sinister qualities (it’s actually quite catchy), and it was that work that he had such gloomy misgivings about that sparked my interest in Liszt’s music in the first place. So it can’t be that dreadful! I’m thankful he didn’t toss it, even though he might have had a burning desire to do so. One of the many factors that excites me about limiting the majority of my research to a certain period in history is when it brings people of two different disciplines together that I already liked as separate entities, especially if one of those people is in the medical profession. Such is the case with William Ernest Henley, Victorian poet, and Sir Joseph Lister, who just so happens to be my personal favorite surgeon of the 1800s. 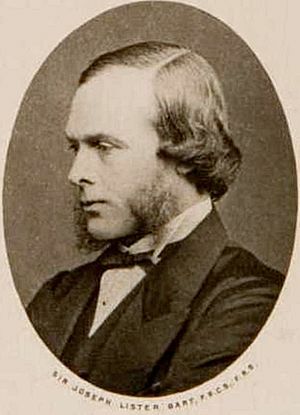 For those unacquainted with Lister, he is known for his antiseptic techniques in surgery in the latter part of the nineteenth century. Louis Pasteur’s articles inspired him to set out on his battle against bacteria and infection in an age when mortality rates in surgery were alarmingly high. 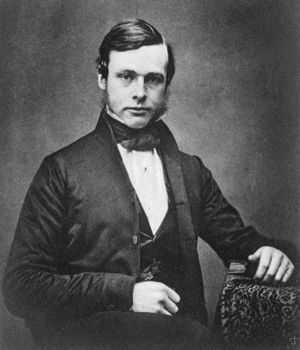 His techniques, which utilized carbolic acid, were tedious, not to mention that Listerism was frowned upon by many other surgeons in its earlier days, who thought it all to be mere humbuggery. Many limbs and lives were saved thanks to the efforts of Lister. He was, however, a transitional figure — although he did rinse his hands in carbolic, he was not the militant hand-washer that Ignac Semmelweis was some decades before. 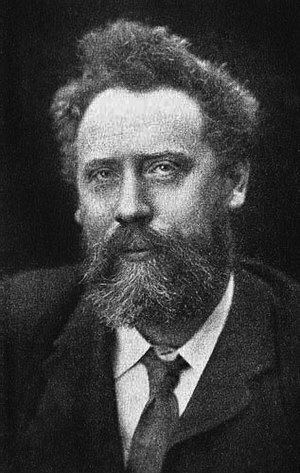 For William Ernest Henley, pain was an inescapable fact of life. He suffered from tuberculosis of the bone; his left leg was amputated at the age of twelve. By the time he was twenty-four, the possibility of amputation loomed over him again, this time in regard to his right foot. He had read of Lister in newspapers, and was desperate to avoid another amputation. He saw this controversial sepsis-fighting surgeon as his only hope. Even Lister was skeptical about this new case, warning him that he might have to resort to amputation, but in the end, Henley was able to keep his foot. 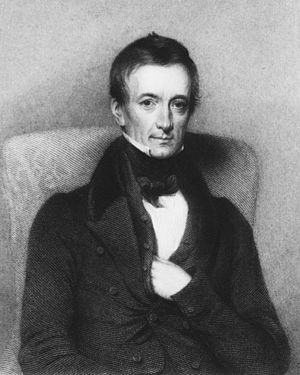 During his stay at the Royal Infirmary in Edinburgh, he read voraciously, wrote like mad, and taught himself three languages, making up for the spotty education he received as a boy due to his poor health. It was also during this time that he wrote the collection of poems, In Hospital. For anyone interested in nineteenth-century medicine, and especially for anyone interested in Lister, the poems of In Hospital are true gems. It’s fascinating to get glimpses of life in the Royal Infirmary from the eyes of a long-time patient. A cozy experience it was not. He desolately describes it as a place “half-workhouse and half-jail.” But there is life in his fellow patients, ailing though they may be, as described in “Children: Private Ward” and “Romance”, which is about the sailor who eventually became his brother-in-law. Henley also creates some colorful depictions of the staff at the hospital, as in his two “Staff-Nurse” poems. As once the son of Zeus with Death and Hell. Henley’s poetry is stylistically unique in that he was an early writer of free verse (obviously, this is not the case in “The Chief”). To my eyes, it gives much of his poetry an anachronistic look — some might say he was ahead of his time. I confess I’m usually not a fan of free verse, but I feel he pulls it off quite well, and when it comes to In Hospital, I’m primarily interested in what he is saying. I might add that Henley is most known for his poem “Invictus.” I confess it isn’t one of my favorites, in spite of its popularity. I’m partial to the poems of In Hospital and Rhymes and Rhythms. And as for “The Chief”, I’m sure it made modest Lister blush to a prodigious degree. …and I know most who know how many books I own would probably scoff at that blog title. But, believe it or not, it is something that I am determined to practice — and have been aiming to do for quite some time. 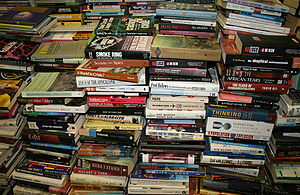 It’s easy to get overrun with books — especially when used book sales pop up. When it’s only $1 or even $0.50 per book, it’s hard to resist. So what if it’s beat up? It’s CHEAP! I think I vaguely recall that author from somewhere…. Nice cover… Unique edition… Has some nice color plates… Excuses, excuses. Do you REALLY need to buy that book? Chances are — probably not. Especially before I moved, I amassed a fair quantity of books. Novels I read in high school and knew I’d never read again. Books that professors were giving away for free that contained information that I may or may not ever need (best to be safe and have the resource, right?). Not to mention the many goodies from used book sales with those irresistibly low prices. But it was, dare I say, too many. And I came to realize that others might get more pleasure out of some of those books than me. So I gave them away. I wouldn’t be surprised if I got rid of over 100 books before I moved (I know it was over 50, at least). And since I’ve been in my new home, I know I’ve gotten rid of at least another 30 or 40. Now, I do still own many, and always will. I have a number of reference materials that I use all the time. And I have many classics — but I keep only the ones that I thoroughly enjoy and have every intention of reading again in the future. I need to keep adequate space on my shelves, though! Recently, I forced myself into a challenge not buy myself a single book for three months. A little tricky on occasion, but overall, it was a good lesson in self-discipline. And it has made it easier to practice what I preach. The reward at end? Three new books — one for each month I didn’t buy any. And they’re all keepers. For quite some time I have been firmly against the nefarious ereader. I have recently bent — backwards — almost had my arm wrenched out of its socket — to finally admit that an ereader might actually be beneficial to me. So I, antiquarian that I am, gave in to the technology of the 21st century at last. And why? …to read the old stuff, of course. The old stuff that is either out of print or is impossible to find in tangible-form, be it fiction or nonfiction… and yet much of it is readily available in digital format. That strikes me as being very ironic. So I’ve had a Nook for about a month, now. I admit that at first I was deeply perplexed by it. And before I figured out how to get books into it from Project Gutenberg, I wanted to run it over with an 18-wheeler out of sheer frustration. But through tinkering about, I’m learning all sorts of things. And I’m getting used to being confined to a fraction of a page at a time. I do like that I can highlight and make notations like a maniac without marring any books (and for research, it’s often necessary, as much as I hate writing in books). Plus, there’s the basic concept of having (currently) 95 books contained in one small space, in comparison to the 350-odd volumes I have spread out in my study. Don’t get me wrong — I love those books to bits (and they’re much more aesthetic than electronic devices). But I realize that I only have room for so many. All pluses and minuses aside, in my case it all boiled down to one major dilemma… Which is more important — the books themselves or the information contained within them? When I need to know something — when I’m doing major research and trying to reap whatever scrap I can find — I simply need those facts and tidbits no matter what the format. It doesn’t exactly matter whether I read a musty tome from the 1800s or via digital edition of a similar old work. What matters to me is that I now have both options, and thus have more open doors to find the necessary information. On one side, the thrill of the hunt to find the old books is exciting and rewarding. On the other, it’s so much easier to just download an ebook. 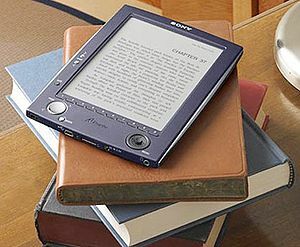 Will the ebook ever replace the tangible volume? I say — CERTAINLY NOT. It is not a substitute, but a supplement. 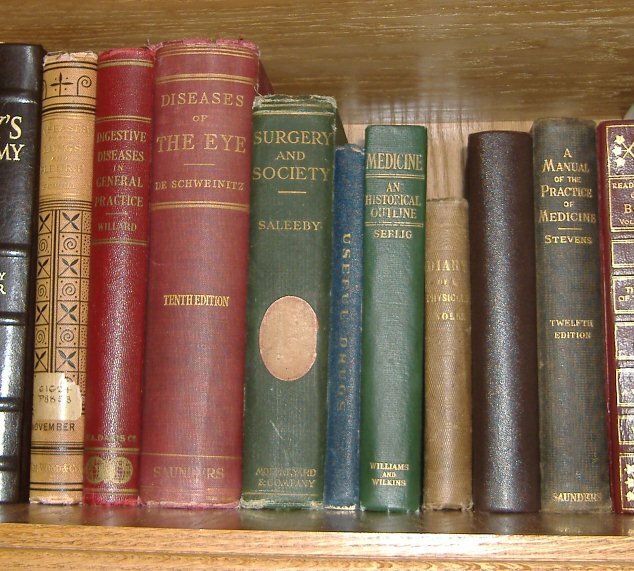 My Nook doesn’t make me sneeze, and that book of anatomy and physiology from 1855 does make me sneeze, but there’s sometime special in holding something authentic, something that’s been around for over 150 years, that no digital book can ever pull off. Digital books may offer a window to the past, but they don’t allow me to touch it. computer, n. one who computes; a reckoner; a calculator. And that is the entire entry for computer found in the 1961 unabridged Webster’s New Twentieth Century Dictionary of the English Language (and that book’s a whopping 5 inches thick). You have the admit — that definition is true. It simply isn’t the whole truth in 2012. And I find it to be a refreshing definition, focusing on the human thinker as opposed to wires, microchips, and the Internet. And then there’s the thesaurus. In my opinion, there are many acceptable, usable dictionaries out there. The only true thesaurus is Roget’s. Roget’s has all of the interesting, poetic words, and the classification system makes it easy to cast a wide net when searching for the appropriate term. If I want to learn something, I know I can always rely on Roget’s. The old Roget’s, that is — the one that still has 1,000 categories — even though the newer editions do have more words. There’s a good chance that I’m not even interested in many of those newer words, anyhow. Of course, I understand that owning a dictionary or thesaurus that contains words like calidity, apricate, gremth, tatterdemalion, or valetudinarian isn’t necessarily at the top of everyone’s priority list. But it is to some, and I’m definitely one of them.